November 6th is the main event. The most important midterm elections of our lifetime. At stake? Majorities in the U.S. Congress, hundreds more local and state seats - and possibly the fate of our country. The party that wins will be decided by one factor: TURNOUT. Americans face a clear, binary choice - but not one vote can be taken for granted. Democratic candidates are sprinting every day to get their message out, but the party cannot do it alone. What we desperately need is a unified, national rallying cry to drive every last voter to the polls. That’s us! 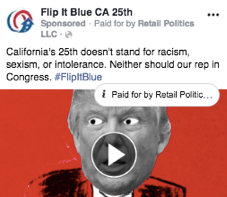 The Flip It Blue campaign is our insurance policy against complacency. It's our ace in the hole to making history and we know it works! 37% of users who saw the ads stopped to watch them (that’s appoximately DOUBLE the <20% view rate typically seen in sports advertising, with known brands and an established passionate fan base). Moderate voters (Romney/Kasich Republicans) stopped to watch the video 38% of the time, proving this appeals to swing voters. Liberals aged 35+ were most likely to watch, with an astounding 45% view through rate, proving this campaign can energize the base. The share rate of .0093% was ~4X the rate typically seen in sports team ads. National and local (Katie Hill) campaigns proved to be complimentary to one another. While the former created cost-effective mass reach ($0.02 per video view), the latter drove deeper engagement (higher view rate, view time, and share rate). These results show the effectiveness of this Campaign. 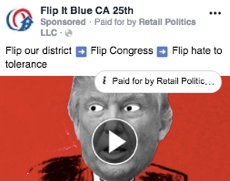 The power of this iconic song and the simplicity of the “Flip it” call to action really resonates with voters, drives engagement and creates an upbeat sense of energy and possibility. 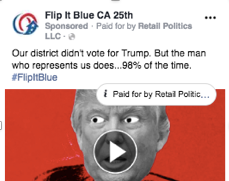 We exposed 65,000 Facebook / Instagram users to two unfinished, un-poll-tested TV “ripomatics.” One was a :30 National message, the other a :15 Candidate message for CA-25 (Katie Hill) north of L.A during the super Tuesday open primary in California.